Women going through menopause experience many symptoms, including bloating. Though stomach problems can be caused by any number of foods and triggers, one factor that has become more and more noticeable is the development of lactose intolerance during menopause. What Causes Lactose Intolerance during Menopause? Like many other health complications during menopause, fluctuating hormone levels can often be the cause of stomach problems. Some doctors contend stomach troubles in menopausal women stem from a change in diet. Adding more fresh fruits and vegetables and complex carbohydrates into their diets could help alleviate stomach problems. However, lactose intolerance is a little different, since it is caused when the body stops producing sufficient lactate— the enzyme in the small intestines that breaks down lactose. People suffering from this medical condition may experience cramping, bloating, or diarrhea after eating dairy products. How Can I Get Calcium without Dairy? 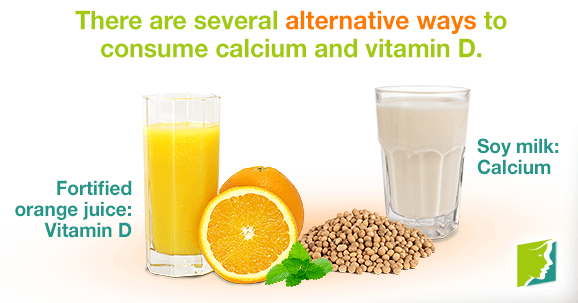 The best natural sources for calcium and vitamin D are milk and other dairy products. However, to prevent bloating, those suffering from lactose intolerance must find other ways of consuming these nutrients. Vitamin D boosts calcium absorption in the bloodstream. Getting a little sunshine, with the protection of sunscreen, counts towards your vitamin D intake, helping break down and absorb calcium. It's important to get sufficient calcium and vitamin D, as deficiencies in these can lead to osteoporosis. Being lactose intolerant shouldn't stop you from getting these essential vitamins. Talk to your doctor to find out if your stomach irritability is lactose intolerance, a product of dietary changes, irritable bowel syndrome (IBS), or another digestive disorder. If you are told to stay away from milk products, there are some treatments available that allow lactose intolerant patients to continue eating dairy. To find out more about digestive problems in menopause, follow this link. Q&A: What Is the Normal Age for Menopause? Menopause may be an uncomfortable stage in women's lives because of the different accompanying symptoms. Learn more about its treatments.